Gayle Bell's Art Studio: Happy New Year! It's hard to believe we're three days into the new year and I've already broken one of my resolutions. So much for doing a sketch a day. It was a nice thought while it lasted but I should have known better. But I'm not going to mope about it. In fact, I'm of the opinion that this year will be way better than the last eight!!!! How could it be any worse? I'm going to do everything I can to make it better, one way or another, as I'm sure millions of other hopeful people will. Happy New Year indeed! Jerry and I celebrated our 12 year wedding anniversary yesterday and after all the holiday madness, it was good to spend some quiet time at home. I had good intentions to finish the painting of Marley today, but after we worked out and put away the decorations, cleaned house and washed clothes, I didn't have much energy left for painting. So we took Marley for a walk and watched a movie. I did happen to pick up yesterday's paper to recycle and caught a story about Doug Bloodworth, a local artist who has painted advertising (artistic advertising!) on the Lynx buses around Orlando for 15 years. 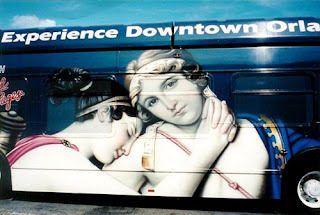 I've always admired the beautiful paintings on the buses and wondered why I hadn't seen too many of them lately. Well, along with the declining economy, the advertisements he once painted on buses are declining also--from as many as 80 buses a year down to one or two a month. He's now selling his paintings in shows and apparently doing well. His art and technique are inspiring and I hope tomorrow to get some time to work on my technique!